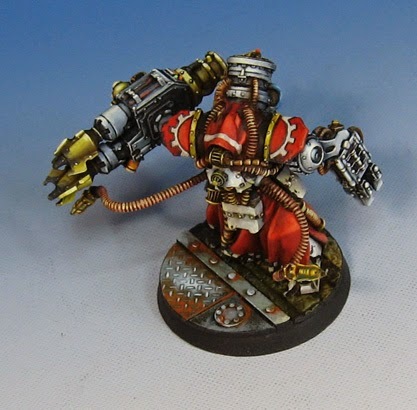 Back to the Mechanicum, and the land of the very strange. These are really unusual miniatures for me, and that's impressive given the vast amounts I have painted in the last 15 years! I had to hack the bottoms of the figures off with a razor saw in order to get them to go on these Dragon Forge bases. They are standing on large piles of rubble. The base size is 40mm, by the way. We lead off today with something truly epic for the Enlightened. 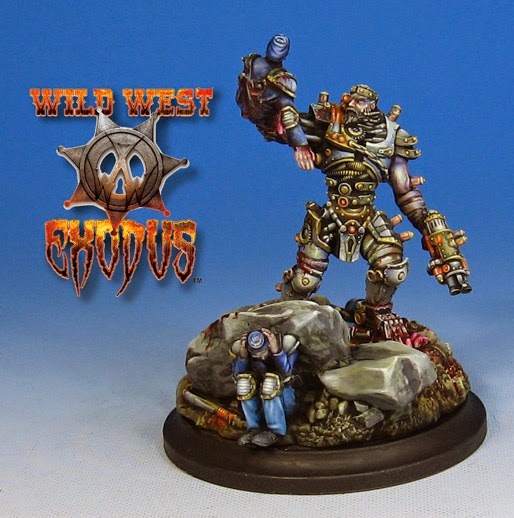 This is the new Legendary Carpathian miniature(s) from Wild West Exodus! While Carpathian himself is a very neat figure, you have to love the rather unfortunate victim, as well as his cowering buddy! You can tell that Carpathian has become rather monstrous in size thanks to the constant infusions of RJ-1027 and his own bizarre modifications and augmentations. Which has given him the strength to create quite a mess on the battlefield! Be sure to check out the kickstarter, because some amazing stretch goals have been added. Also, WWX has been posting the beta cards for a number of characters, hired hands, and so on. This means that you can playtest and theorize about possible faction choices well in advance. This is a lot of extra work, but it definitely helps in making any budgeting choices. Rather than pure speculation and guesswork, you can go ahead, proxy some stuff, and duke it out!